Rescued Swan Released Back To His Love After Being Treated Successfully For a Severe Infection! These Two Have Been Together For Over 10 Years and Have Had Dozens Of Offspring! They're the kind of couple that would finish each other's sentences — if they spoke in sentences. But when one swan got sick, he was separated from his love. Saddled with a severe infection, the swan had to leave the Netherlands canal the pair calls home to be treated. For probably the first time since they chose each other 10 years ago, the perfectly matched couple was torn apart. A beautiful video making the internet rounds among animal lovers everywhere shows the moment when the recovered swan returns to his love. 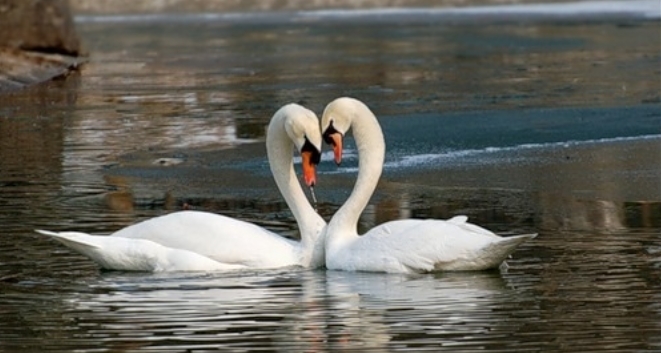 Swans form monogamous pair bonds that last for many years, and in some cases these bonds can last for life. Their loyalty to their mates is so storied that the image of two swans swimming with their necks entwined in the shape of a heart has become a nearly universal symbol of love. Why birds mate for life isn't as romantic as it first appears, though. Considering the time needed to migrate, establish territories, incubation, and raising their young, spending extra time to attract a mate would minimize reproductive time. Responses to "Swan Couple Separated By Sickness Has Sweetest Reunion"